The White Horse at Uffington is the best known and, by far, the oldest of the white horse hill-figures to be seen around Britain. Its three hundred and sixty feet by one hundred and thirty feet gleaming chalk body prances across the Berkshire Downs on White Horse Hill, immediately above the villages of Woolstone and Uffington. The horse’s form is sleek, 'beaked', disjointed and somewhat abstract. Certainly elegant, if anorexic. Some people have trouble recognising it as a horse at all. It is best viewed from a distance - somewhere along the road from Shrivenham to Faringdon – but, even then, the thirty-degree slope on which it lies makes it difficult to appreciate properly without chartering a helicopter. The surrounding landscape is home to a number of other features with similarly evocative names. The steep combe below the horse is known as the ‘manger’. The ice-cut terraces to west are the ‘Giant’s Stair’. ‘Dragon Hill’ – a natural outcrop with an artificially flattened top – is just to the North. While the great expanse of ‘Uffington Castle,’ a hillfort dating from 700 bc, guards the southern approaches. Further a-field are the ‘Blowing Stone’ and ‘Wayland’s Smithy’. 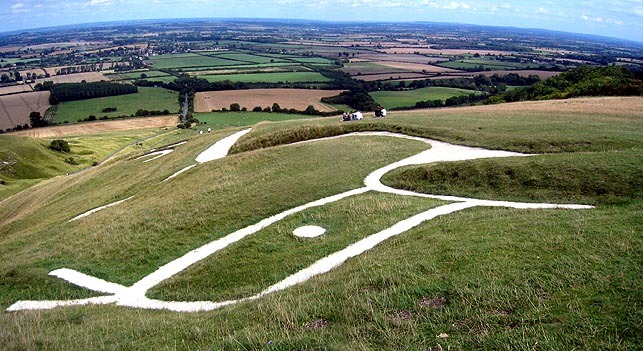 Most of the sturdy White Horse hill-figures across the border in Wiltshire date from the eighteenth century. No doubt they were inspired by the Uffington creature whose existence is first recorded in the cartulary of Abingdon Abbey, dating from King Henry II’s reign. There is a reference to land near ‘White Horse Hill’ which had been inherited by one Godric Cild in 1070s. In the 1180s, Ralf de Deceto wrote a tract proclaiming the horse "and its foal" to be the 5th wonder of Britain! And in later works it was promoted to 2nd place, only being narrowly beaten by Stonehenge. No further mention of the figure is made until a passing reference by Camden in 1586. Thomas Baskerville’s Travel Journal of 1677 was the first to record that the horse was kept in good repair by the locals. Whilst, by 1813, drawings had begun to appear showing a creature not dissimilar to that we see today. Although Lysons’ ‘Britannia’ indicates that it once wore a saddle and, earlier in 1757, a letter from a Dr Richard Pococke, perhaps mistakenly, referred to the how "green sod remains to fill the body" as if the horse’s belly was also once delineated.